Profusion Beautyberry | Gurney's Seed & Nursery Co.
Hardy shrub produces loads of vibrant violet-purple berries that attract birds in the fall. Stems add interest and color to autumn cut flower arrangements. Fruit persists beyond leaf drop. Plant in full sun to partial shade. Grows 6-8 ft. tall. Potted. Zones 6-8. FoliageOvate to elliptic, tapered , medium green leaves reach up to 4 inches long. Flower FormSmall blooms in auxillary cymes. Not very noticable. PruningCan be cut back near to the ground in late Winter to renew growth in Spring. Prune late Winter to early Spring. CommentsGrown primarily for the outstanding colorful berries it produces in late Summer to Fall. 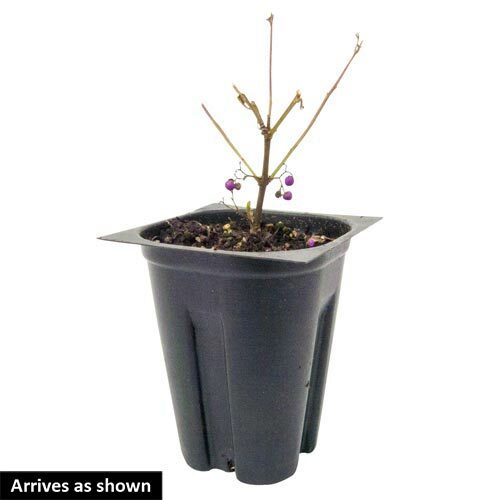 An upright growing shrub perfect for a spot where you can watch the songbirds stopping by to enjoy the beautiful berries. 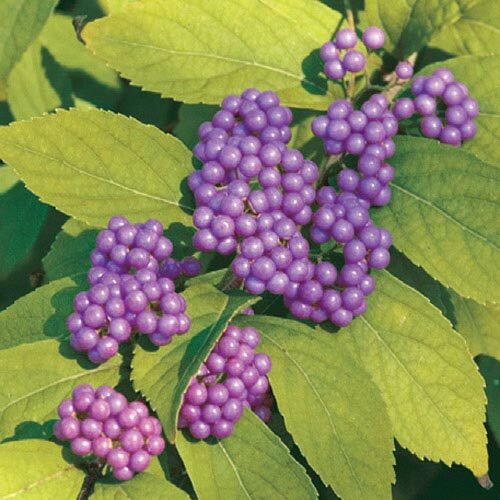 After leaves Fall in Autumn, the slender stems are loaded with purple berries at each axil, are even more showy. Cut a few stems to add excellent color to a cut flower arrangement. Unable to ship to: AE, AK, GU, HI, PR. DepthFull sun in the North, but dappled shade in the South.